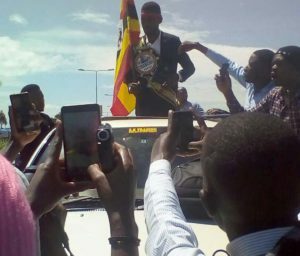 Bobi Wine stands atop his car soon after arrival at Entebbe. PML photo. Police has finally spoken out on why musician-turned legislator, Bobi Wine, was held at Entebbe Airport on his return from USA yesterday afternoon. According to police, Bobi Wine was not arrested but only brought in to answer various questions in connection with a recorded audio message he circulated when going to the Diaspora to attend the Goalkeepers conference and also to advise him not to hold any “unlawful” gathering and procession as he returned from the global conference. The police further explained that the “BikwaseKyagulanyi” singer recorded an audio capable of inciting the public and causing instability in the country. He was, therefore, needed at Entebbe Police to explain the motive of the audio message. The message went viral on social media platforms and police decided to talk to him when he returns. Police, therefore, detained him so that he explains his message and records a statement at Entebbe police station. Bobi Wine while appearing on NBS television soon after his release from police custody last night urged all Ugandans to rise up and defend the Constitution before the Constitution is too weak to defend them. He also called upon his supporters to join him on Tuesday as he heads to Parliament to defend the Constitution. The motion that seeks to amend Article 102 (b) of the Constitution is expected to be table on Tuesday. This follows deputy Speaker Jacob Oulanyah’s decision to defer the motion during a Parliament sitting on Thursday.